The township now known as Otto was first organized on March 14, 1871, and attached to Rush Lake township for civil and criminal jurisdiction. It remained a part of the latter township until March 22, 1883, when the commissioners organized it as Otto township upon the petition of George Udell, and thirty others residents of congressional township 135, range 38. The petitioners asked that the township be called Lake View, but for some reason, which is not stated in the record the board saw fit to call it Otto. The first election for township officials was held at the Jacob Smith school house on Tuesday, April 10, 1893. The thirty-one signers of the petition asking for the organization of Otto township were as follow: George Udell, G. McDonald, Jacob Anderson, Isaac West, John Teuki, Nils Johansen, Levi Stevens, S. F. Sawyer, Solomon -----, Isak Carl Lunt, Ysak Mikalson (next three names illegible) Henry Johnson, Gustav Wakkinen (next four names illegible), C. J. Hayes, F. Reynolds, William Roberts, Fred Reynolds, Edward Hewitt, Eliza Udell, William Smith, Martin Gillespie and John Smith. The illegible names on the petition are very evidently Norwegian or German. 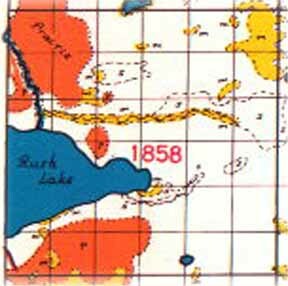 Otto township lies in the immediate basin of the Red river system and, although it has no lake entirely within its limits, at least half of Rush lake is in the township. Section 19 is entirely covered by this lake, the greater part of sections 20 and 30, as well as parts of sections 18, 29, 21 and 28. This lake drains the entire township and is a great benefit for artificial drainage. The Red river enters this township in the southwestern part of section 6 and flows through sections 7 and 18, where it empties into Rush lake. This was the fifty-seventh township organized in the county, although it had been attached to Rush Lake for civil and criminal jurisdiction since 1871. It is bounded on the north by Pine Lake, on the west by Rush Lake, on the south by Leaf Lake and on the east by Newton. The Northern Pacific railroad runs through the northeast corner of the state, passing diagonally through sections 1 and 2. It is evident that this township was settled much earlier than some of the other townships that were organized much sooner, but evidently the settlers did not feel the need for separate township government. It is truly an agricultural township as there is no platted village within its limits. Before the advent of the rural routes there was a postoffice at St. Lawrence. The town hall is located in section 21. There are three churches in the township, one in section 31, another in section 7 and a third in section 26. This township is thickly settled as evinced by the size of the farms which range from forty to one hundred and sixty acres. The present township officers are as follow: Supervisors, Walter Reynolds and John Perala; clerk, Walter West; treasurer, Jones Ogala; assessor, William Oman; justice, Joe Nau; constable, Charles Nampa. Places of birth for Otto Township in the 1905 state census.